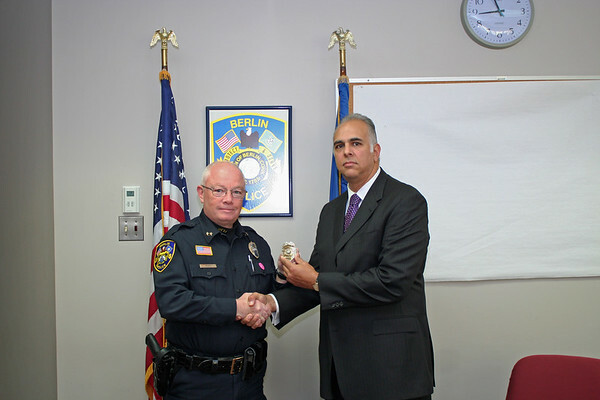 BERLIN - Officer Achilles Rethis, 51, was sworn in recently at police headquarters, 240 Kensington Road. Rethis joins the Berlin force after 27 years with the Hartford Police Department, most recently retiring from there as a captain. He now lives in Newington right around the corner from Klett, but his future move wouldn’t be because of the chief, Rethis joked with his new boss. The appointment brings the department’s staffing vacancies from promotions, retirements and resignations down to one, Deputy Chief Chris Ciuci said. However, three officers are still in the academy, with two expecting to graduate in December. The third just began his 9-month training stint there last month. Rethis will undergo training on the layout of the town and administrative functions of the department for only about a month, Ciuci said, as he is already a certified officer. With two officers out on long-term sick leave, the department may have to pull the McGee Middle School school resource officer at some point, Ciuci added, which has been done before when staffing has been short. But it is not being done now, he said. “It’s a delicate balance,” said Ciuci of keeping the officer in the school while being careful not to burn out other officers on overtime to cover the vacancies. Rethis holds a master’s degree from Trinity College and received training at the selective three-month FBI National Academy in Quantico, Va., Ciuci said. He, Klett and Sgt. John McCormack also trained at Quantico, said Ciuci. Posted in New Britain Herald, Berlin on Thursday, 8 November 2018 21:27. Updated: Thursday, 8 November 2018 21:30.